It is important to map out how you will go about searching for research materials on your topic prior to beginning your search. 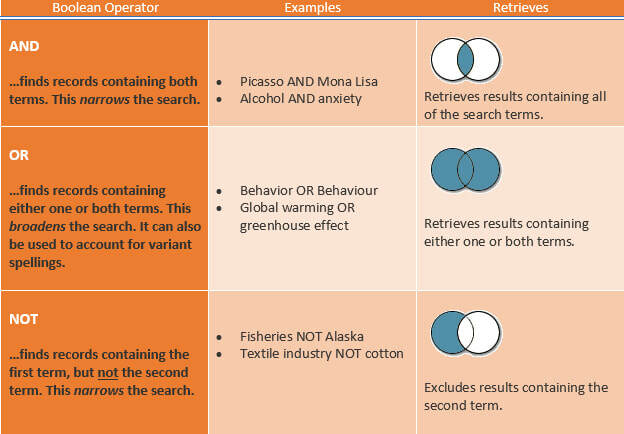 Here is an example of a search strategy worksheet that you may find helpful as you read through this page. Example: How does exposure to smokers affect children who have asthma? What are the main concepts or keywords? Think of synonyms, alternate words or/and related words. Develop your search strategy using the terms above. Mix and match terms. If one keyword doesn't work, try to vary your keywords with synonyms. Boolean operators help to narrow or broaden your search. The most useful are AND, OR, NOT which help to connect keywords or concepts. You should have a research topic and a list of some keywords as well as a search strategy. Next, let's find books, articles and other materials to use in our research project!